MUZ : sketchblog: Fame At Last! I will have my art displayed at the 2011 H.P. Lovecraft Film Festival®, USA! Artists artwork will be projected onto movie screens before, inbetween, and after viewings of several HPL-themed short movies, and film director Guillermo del Toro will be judging the movies. Legendary movie icon Roger Corman will be in attendance to accept the "Howie" (Howard Phillips Lovecraft) award for contributions to Lovecraft cinema. -Corman has been a mentor to young film directors including Francis Ford Coppola, Martin Scorsese, Ron Howard, Peter Bogdanovich, Jonathan Demme, James Cameron, Curtis Hanson, John Sayles, and many others. He has also helped launch the careers of actors including Jack Nicholson, William Shatner, Peter Fonda, Dennis Hopper, Talia Shire and Robert De Niro. The festival will be held on September 16th-17th, 2011, at the Warner Grand, San Pedro (LA), California. Sadly I will not be going myself, but I feel my artwork will be like my wee ambassador's. They will do me proud. The H.P. Lovecraft Film Festival promotes the works of H.P. Lovecraft, literary horror, and weird tales through the cinematic adaptations by professional and amateur filmmakers. The festival was founded in 1995 by Andrew Migliore in the hope that H.P. Lovecraft would be rightly recognized as a master of gothic horror and his work more faithfully adapted to film and television. Here is a link to the H.P. 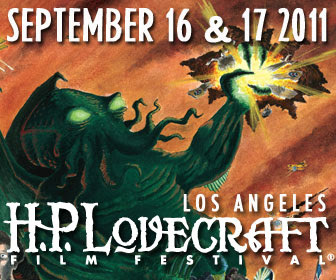 Lovecraft Film festival & Cthulhu Con website. Ooooh! I am pretty excited!!! I need to have a lie down now.